The DVGRR Dogs need your help decorating their 2018 Giving Tree scene! 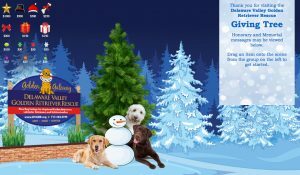 Join in and help the DVGRR Dogs by decorating their 2018 Giving Tree scene! The DVGRR Dogs’ 2018 Giving Tree fundraiser is an easy way to help support the mission of giving new beginnings to displaced Golden Retrievers and other golden-hearted retrievers, along helping to support a full array of adoptive and educational support we give to the community. CLICK HERE to view and support the DVGRR Dogs’ 2018 Giving Tree page. Drag and drop the icons to the scene and follow the check out process to see your icon appear forever in the scene. Your name and message will appear below the scene. All names and messages will appear with the most recent on top. Visit the tree often to see the scene become festive and share the link to help the DVGRR Dogs! So whether you’re honoring a family member (furry or human) or memorializing a loved one, we THANK YOU for your support for the DVGRR Dogs! If you have questions about DVGRR or the Dogs’ 2018 Giving Tree, email Inza Adams, Development and Donor Engagement Manager, at inza@dvgrr.org.